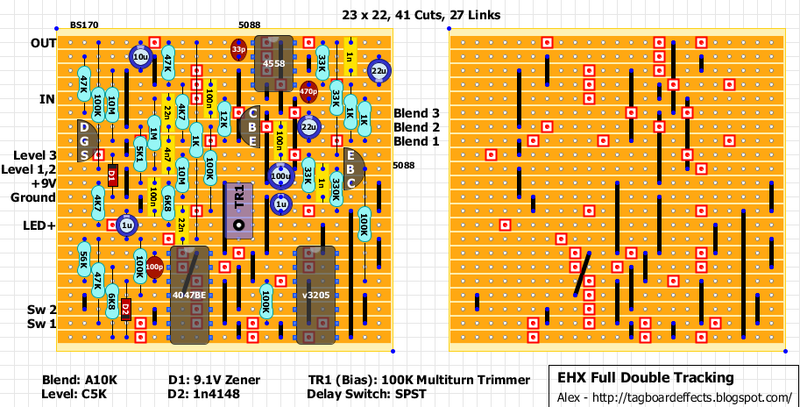 Here is a verified layout for a quite unknown slapback-echo EH pedal. You can find the original FSB thread here. I've added an output boost to cover volume loss. I've found only one video around but didn't sound great. 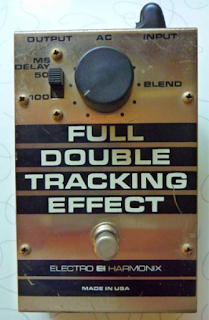 What is the difference between a double-tracking effect and a chorus effect? Is it simply just the modulation of the delayed signal, which in this pedal is controlled by the 50ms/100ms 2-position switch? 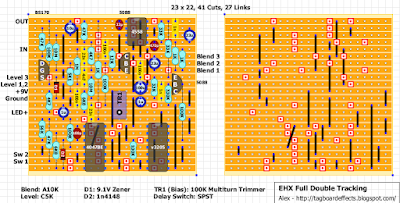 Couldn't you modify this circuit just a bit to add continuous fluctuations to the delay time, making this a chorus OR a double-tracking effect? If I'm way off-base I apologize, I could use some education.. I built this one. I'm not getting any slapback/echo. The output boost and blend pot work perfectly. I'm using MN3205. I have several 3205’s that I tried in there, and they were all tested beforehand. Nothing wrong with the chips, so I'm not sure why it's not echoing. There’s no echo on any part of the bias trimmer. I'm going to go over it with the schematic and check it out against the other verified vero layout on FSB to see if I can get it going. Just thought I would post here in case anyone else built it and encountered a similar issue. Not sure what's wrong but this layout has already been verified by zombie_rock123 in the Forum section. Thanks for your message, Alex. I'm sure it's something I've overlooked. I will check out that thread in the forum section as well while I'm troubleshooting next weekend. I went over this build for a few hours yesterday, so I could try to rule out the usual suspects (tiny bridges, stuff in wrong holes, etc.). After not finding any visible errors on the board, I decided to switch out the multi-turn trimmer for a regular single turn trimmer and oila! It works. Just thought I would add that here in the comments in case anyone else builds it and runs into a similar snag. I have a tiny, high-pitched whine in the background. I imagine it will go away once this is boxed. I just love these older Electro-Harmonix effects. Thanks a bunch for the layout and the advice. I built this effect and get a good slap back echo but I have also some strange noises in the amp coming from the effect. After a few minutes of use, I hear brief cracks that repeat every second until I stop the power. After switching on the current it is the same process 5 or 10 minutes later ?! Aisha, check your solders. For me, a bad one on the Ic 4047BE. Between what rows should i exacly put the trimmer?